Paige joined the CrossBridge staff in February of 2014. She and her husband Evan have been married twenty-three years and have two children, Samuel and Rebekah. Paige was born and raised in Baton Rouge, LA. In 1989 she moved to Alabama where she graduated from Samford University in 1993 with a BS in Education. 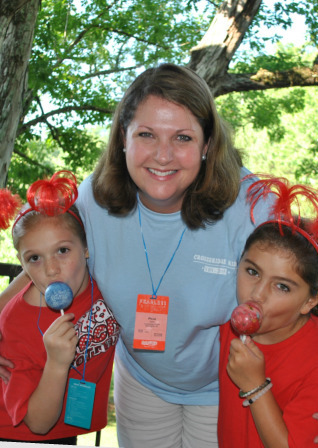 Paige has worked with and ministered to children for many years. Paige's experience includes leadership roles at Honey Rock Camp, Parker House Center for Abused and Neglected Children, Presbyterian Child Development Center, Camp Chattahoochee, Emmaus with Child, Shannon Forest Christian School, and most recently, Homewood Dayschool. Paige is excited to be a part of the CrossBridge family and all that God is doing here. "I have a passion for sharing Christ with children and their families. I want each child to feel the love of Christ every time they walk into our building. I want children to fall in love with Jesus, to become grounded in God's Word, and to undersatnd that God gave us a helper, the Holy Spirit. My desire is for our children to become courageous disciples for Christ that boldly and unapologetically share the gospel of the truth. My desire is to partner with parents and their children in the pursuit of Jesus Christ, and to honor Christ as His faithful servant."